This online payment portal has been designed to be as easy-to-use and trouble-free as possible. However, some websites require Windows Internet Explorer to run in 'compatibility mode' in order to access all of the features. 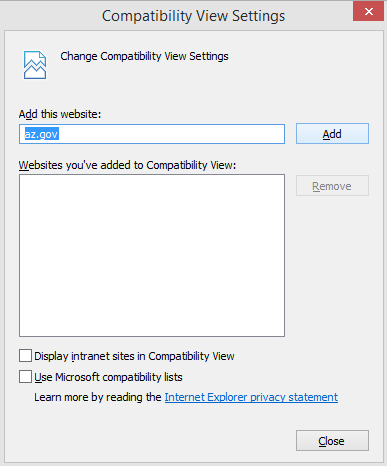 To enable 'compatibility mode' for a website, follow the instructions listed below. 1. Click on the Settings icon in the top right corner of IE11. 2. 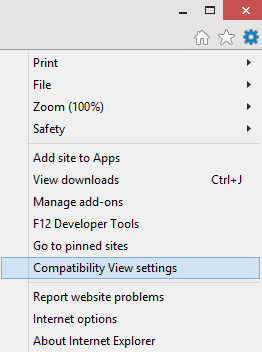 Click the 'Compatibility View Settings' Link. 3. Click the 'Add' button to add az.gov to the compatibility settings. 5. For best results, close the browser entirely, reopen the browser, and navigate to the ADVS Online Payment Page.